Photo by Christian Gardner for SpeedwayMedia.com. 1. Kyle Busch: Busch started 14th and finished third at Martinsville, posting his fifth top five of the season. 2. Brad Keselowski: Keselowski dominated at Martinsville, leading 446 of 500 laps to win the STP 500. 3. Denny Hamlin: Hamlin took fifth in the STP 500 at Martinsville, posting his third top five of the season. 4. Joey Logano: Logano started on the pole at Martinsville and finished 19th. 5. Martin Truex Jr.: Truex finished eighth in the STP 500 and is seventh in the Monster Energy Cup points standings. 6. Kevin Harvick: Harvick finished sixth at Martinsville. 7. Aric Almirola: Almirola started second and finished ninth at Martinsville. 8. Kurt Busch: Busch finished 12th at Martinsville. 9. Chase Elliott: Elliott led 49 laps, but was no match for Brad Keselowski, who routed the field at Martinsville. Elliott settled for the runner-up spot. 10. 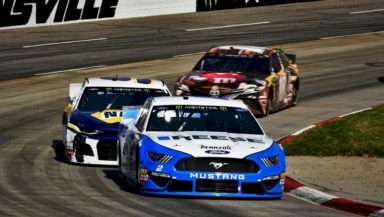 Ryan Blaney: Blaney took fourth at Martinsville and is eighth in the Monster Energy Cup standings, 70 out of first.